Initially I was climbing up to the barn roof and jumping off. It wasn’t working. I had no problem with take off and flying to a lower elevation. Gaining altitude, sustained flight, and landing, however, were somewhat problematic. So I started to learn to fly a Radian electric sailplane. That also did not work well. These first two shots are of a friend flying his Radian. Never a problem. 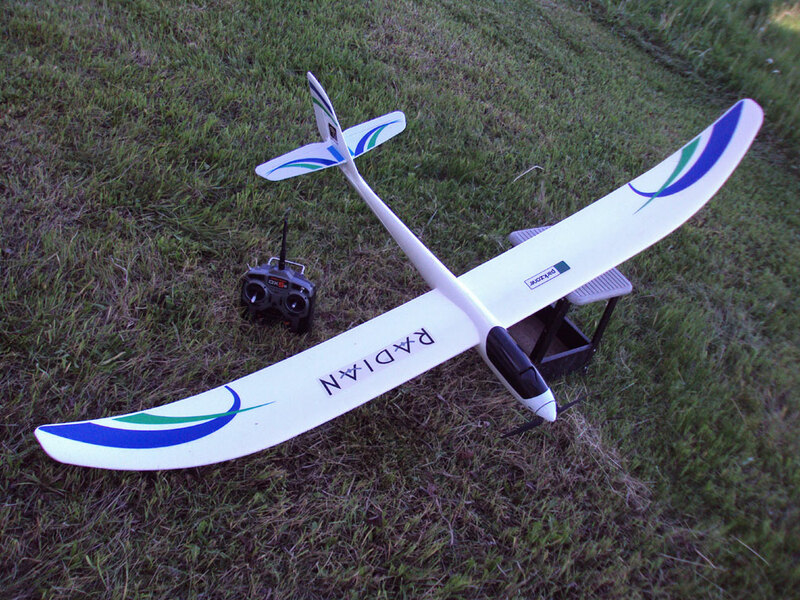 The third shot is of my sailplane just prior to the first flight. The fourth photo was taken a minute later. I gathered the scattered pieces so they all fit in the shot. The next day after using Gorilla glue to fix the fuselage, I crashed again in even less time, again breaking the fuselage in two. I was having SO much fun. This time I put the fuselage together with 5-minute epoxy even though the Gorilla glue worked fine. 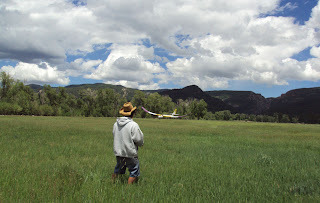 Remember James, from Rodeo, who got me interested in electric sailplanes while down in the Gila Mtns? Well, he was going to be passing through Chama on his way to Colorado so I decided to not fly until he got here (and anyway, I had to wait for a replacement battery). This was smart decision. One thing he told me was that the trim settings on my transmitter were way off, hence the sailplane’s urge to turn left and dive. I was also told to turn off the motor whenever the plane was low and headed towards the ground but my mind kind of freezes prior to crashes. I flew his Radian a few times and did a couple of landings. Whenever I got in trouble with the controls, I passed the transmitter to James and he got the plane straightened out. I lost track of how many times I passed the transmitter. I was given a slew of tips that should prove helpful in this endeavor. There is way more to flying an electric sailplane than I had thought and this pleases me no end. In addition to learning to fly it, I have to learn how to search for updrafts and thermals. Should be interesting hunting for something that I can’t see. 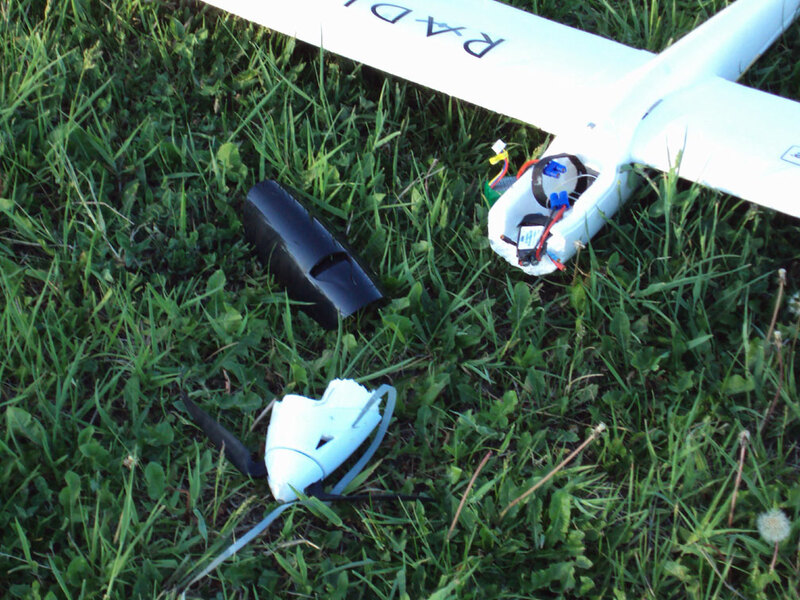 A couple days after James left, I received the replacement battery, installed it and went out to fly. My first two flights again lasted less than a minute each but at least I remembered to turn off the motor as the sailplane headed towards the ground and the landings were soft. The third flight was one I REALLY could have done without. I managed to keep the plane up but couldn’t set the trim properly. I couldn’t get it to straighten out; it just kept going into turns. 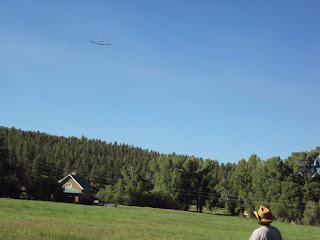 With all my focus on trying to control the plane, I forgot to turn the motor off once it got up a couple hundred feet. BIG MISTAKE. 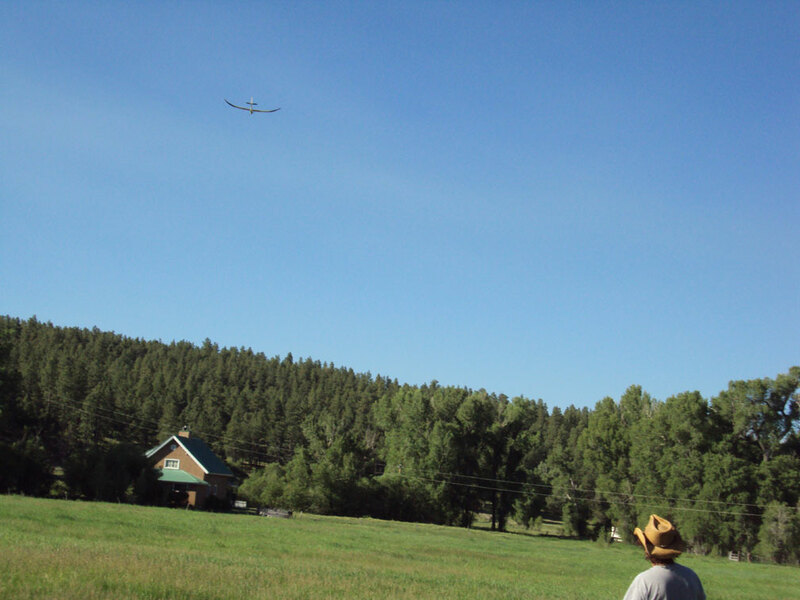 By the time I realized the motor was still on, the plane was over the pine forest beyond the meadow (those trees in the first photo); I could barely see it; and I still could not control its flight. I turned the motor off; the plane soon started down behind the trees and I lost it. I spent an hour looking for it and another hour and a half the next day with not luck. Are the gods telling me something here? Anyone need a transmitter and battery charger? James mentioned the servos that control the elevator and rudder can die in flight and you lose control of the plane through no fault of your own. He’s climbed trees to retrieve planes even though he is an excellent pilot. I can’t believe I lost a plane. If I lose another one, I’m gonna to bag it. I’m a leaf on the wind. Watch how I soar. Didn’t like working my way up through central NM much. Luckily rt1 parallels I-25 so I didn’t have to do the interstate. Turned off rt1 onto FR 225 into the San Mateo Mountains for a couple days. Six slow miles of washboard to a decent camping spot if one likes open areas. This time of year it was too hot and too windy to roll out the awning. 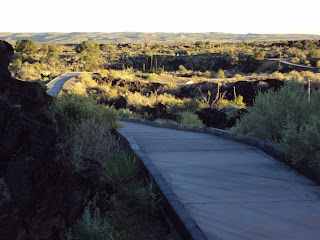 One day we went for a walk down in a wash.
Then I moved on to a night at Valley of Fires. I had heard good things about it and had been driving for 100 miles so was ready to stop for the day. Really don’t like these asphalt miles. I know, I know, I actually paid for a camping spot ($12) in warm weather. Hopefully it won’t happen again until November. The gods made sure I didn’t overly enjoy it. Took a site down a cul-de-sac so I could let M/O out. There was no one around anyway, the RVs were all at the electric sites. There was only a mile of trails but they have an informative nature walk, paved for wheelchairs, that’s definitely worth checking out. 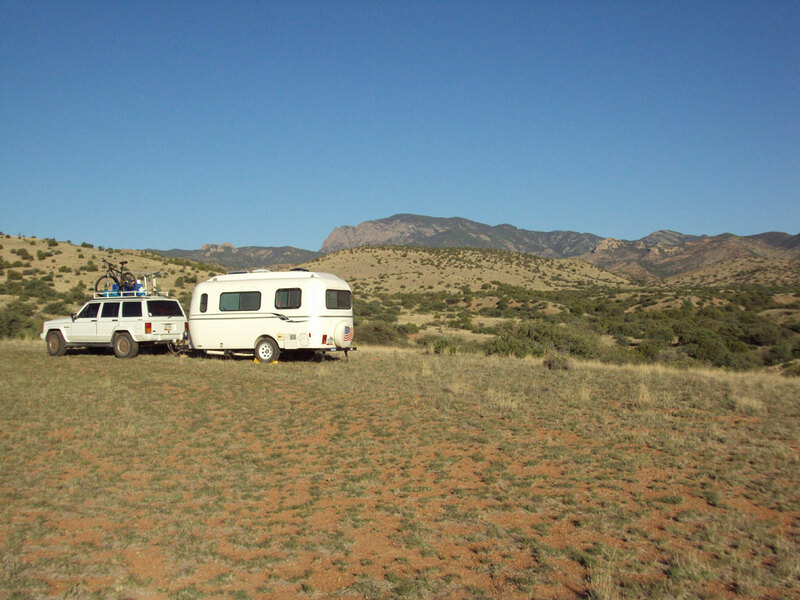 The host gave me a suggestion for free BLM camping with access to a lot of trails, not all that far away. I’ll definitely check that out if I come back through this way since I won’t be staying here again. Made a note about the BLM spot in my road notebook so I won’t forget. Sure do find keeping that notebook helpful. Headed north out of Carrizo on rt54 and turned west on FR 161 into another section of the Cibolo national forest, just before Gallinas. Found a nice spot to camp about 7 miles up off a spur road and spent a few days there. One day when we went for a walk, Onyx got spooked. We were walking along this cow path and came up on some cows. One was lying down near the path and when we got close, she stood up. 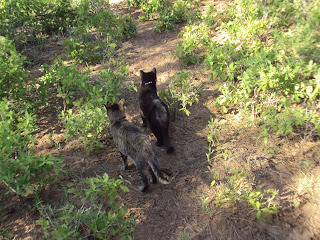 Meadow and I just kept on walking but Onyx turned around and hightailed it back the way we came. 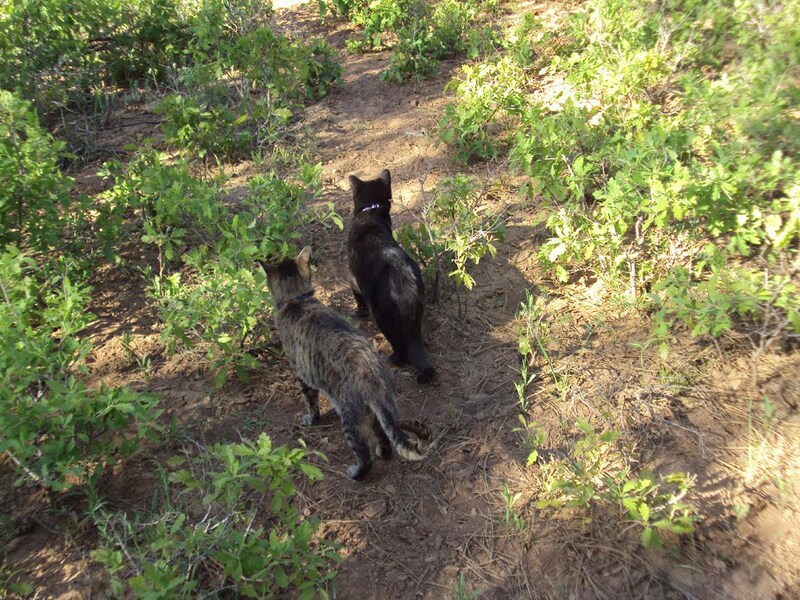 It has happened before and Onyx was always back at camp by the time Meadow and I looped around and got back there. This time he wasn’t in camp. After an hour he still was not back so Meadow and I started out on the path again. 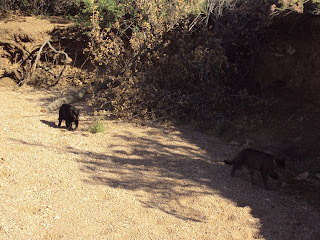 I called his name from time to time and he came out of the brush with his tail up in the air about 10 minutes up the trail. We all turned back to camp. He’s high maintenance. The day we headed out from a spot a bit farther north was the pits. I made a stop in Las Vegas for supplies and some quick web access. 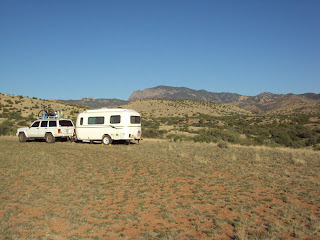 Then I planned to head into a section of the Santa Fe Mountains south of Bernal for a couple days. That didn’t pan out so I headed over to Rowe and down rt34 looking for a camping spot. That also did not pan out. Then I tried up rt63 north of Pecos. Yep you guessed itditto. So I continued on to Santa Fe. They were just getting over a power outage and the traffic lights were still down. It took SO long to get through the intersections on St. Francis Drive. I could not understand why there were no enterprising individuals with coolers at each intersection, walking up and down between the lanes selling beer. The highlight of the day was stopping at REI and finally getting a decent pair of hiking bootsmy first (of many) pair of Keen’s. My friend, Janet from Salt Lake, had first told me about this brand. THANKS JANET. What a stellar shoe. Heading out of Santa Fe on rt84, I noticed I was getting awful gas mileage. 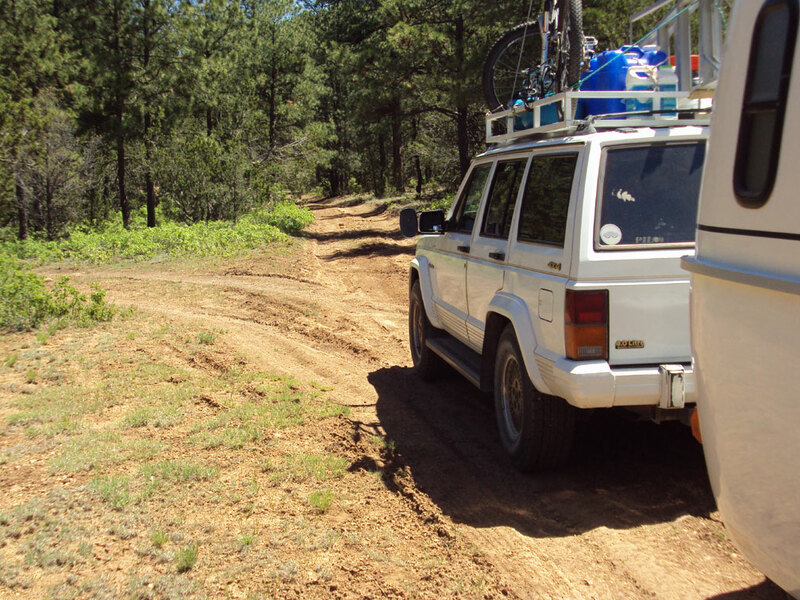 As I turned onto rt115 towards Canjilon for a few days camping in the Carson national forest, the Jeep bogged but kept going. A couple miles up the road it died. I pulled over and looked under the hood because that’s the thing to do. Didn’t have a clue on what to look for. Looking underneath the Cherokee, I didn’t see anything leaking. I went to start it up, it started, looked under the hood and didn’t notice anything. Looked underneathguano! Gas was pouring out of a line. No cell coverage so no calling my roadside assistant plan. A number of people stopped to ask if I needed help. Yes, I needed a winning lottery number. I asked if there was a backyard mechanic close by. The gods felt they had messed with me enough for the day and provided one. Brian got me back on the road and only charged me $40. He said that the fix would probably hold but I should have a garage check it out. I thought it might not be smart to continue up rt115 and go off onto dirt roads so I continued onto Chama. 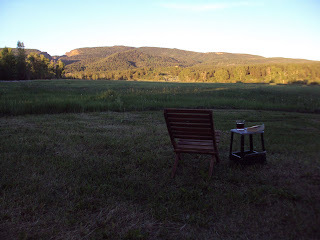 I stayed on Siscily’s property until it was time to move over to Pat and Mary Ann’s. What a dayon the road from 8:30 to 7:30. 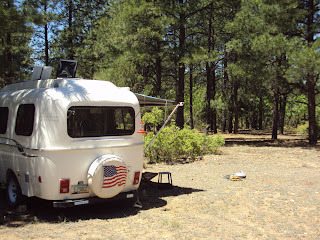 Might as well get into RVing. The next day I made an appointment to have the gas line looked at and stopped over at Mary Ann and Pat’s place. I had met Mary Ann a couple years ago at Siscily’s but didn’t know Pat who I then met along with their dogs, Tera and Tico, and their cat, Griago. What a place they have! 17 acres, a stellar view and handy access to mountains. A place like this would bring an end to my lifestyle. Sure am going to enjoy spending a month watching the place for them. Pat took me mountain biking one day to show me numerous places to ride, run, and hike while I’m here. I almost feel like the desert in a cloudburst. I can die the day they get back and life will have been good. While staying at Siscily’s, I biked on some of the dirt roads Pat had pointed out. One day I was going along on a double track and 2 elk ran across in front of me, not all that close butBIG animals. I had a flash of that song, ‘Grandma Got Run Over by a Reindeer’. June Night SkyCheckout this site for info on the space station and space shuttle. but in the fewness of my wants.